In Texas, liquor laws require tax stamp application to each liquor bottle sold wholesale (to restaurants, clubs, hotels). Dallas-based Goody Goody Liquor needed a faster way to automate the process of reading stamps to ensure compliance. The system needed to do this without human intervention, and to store the bottle number in the company’s database for compliance purposes. Goody Goody, which operates numerous stores, also works in wholesale. Its wholesale division services over 700 hotels and restaurants in the Dallas Metroplex area alone, and the time it takes to deal with tax stamps for those locations is significant. Goody Goody Liquor partnered with Cisco-Eagle to build a system that automatically applies the tax stamps with ID barcodes and reads the barcode for verification and tracking. 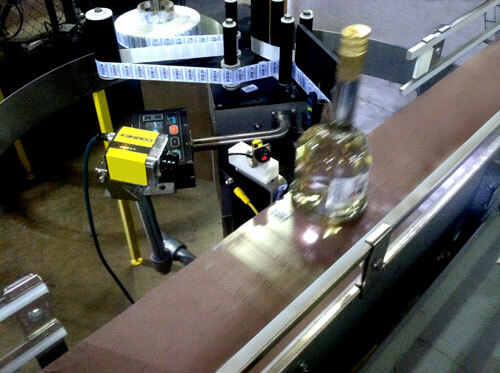 Machine vision is used to identify bottles that do not have a stamp on them so they can be removed from the line. Machine vision also captures the tax stamp number so it can be entered into a database along with the bottle number to help when there are audits. The conveyor system operates very fast—it processes bottles at a rate of one per second—so a fast-reading, highly accurate barcode scanner was essential. Since bottles come in a wide variety of shapes and sizes, and also have labels with a broad variety of label backgrounds, this was challenging. Add to that, the label position is almost never consistent, that the product coloring itself and lighting situation can vary, and the reader was a critical need. Also, since inventories and product mix will change over time, the system had to be flexible. The communication and integration of the system is achieved utilizing a Rockwell PLC and Ethernet IP protocol, and commands to the camera and barcode reader can be changed with minimal programming. With this system, Goody Goody is able to achieve future growth goals without adding significant personnel or reducing the speed of its tax stamp labeling and compliance.